The fantasy football waiver wire can often make or break your season. Making the right decision on which players to add and drop is crucial, so we have you set up with a deep list of potential waiver wire adds for Week 14. Lamar Jackson, BAL (25-50%) — He offers almost nothing as a passer, but Jackson’s upside as a runner is still very appealing for the fantasy stretch run. Jameis Winston, TB (25-50%) — It could implode at any time, but Winston is in the QB1 conversation for now. 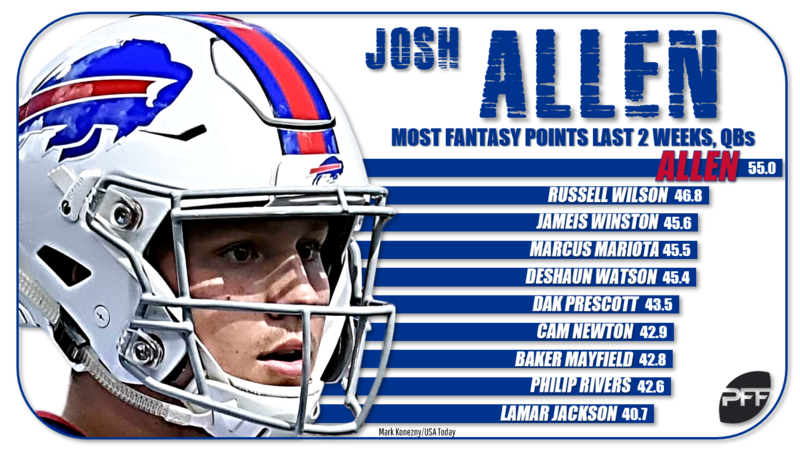 Josh Allen, BUF (25-50%) — Allen is on fire. He went over 100 rushing yards last week and threw for two passing scores. Jeff Wilson Jr., SF (25-50%) — Not quite how we drew it up, but Wilson will serve as the lead back in Week 14 with Matt Brieda banged up with an ankle injury. Jaylen Samuels, PIT (25-50%) — James Conner‘s status is unclear, but Samuels is the next man up if Conner ends up being sidelined. Chris Godwin, TB (25-50%) — With DeSean Jackson sidelined, Godwin posted a 100-yard performance in Week 13. He offers big time upside as long as Jackson is out. Dante Pettis, SF (25-50%) — The rookie is finally healthy and he exploded in Week 13. Look for Pettis to continue to produce down the fantasy stretch. Adam Humphries, TB (20-40%) — He doesn’t offer as much upside as Godwin, but Humphries will continue to see plenty of work for the Bucs. Jaylen Samuels, PIT (20-40%) — Yep, he’s TE-eligible on some commissioner sites. Baker Mayfield, CLV (5-10%) — It wasn’t the best performance out of Mayfield last week, but he still managed to nearly throw for 400 yards. 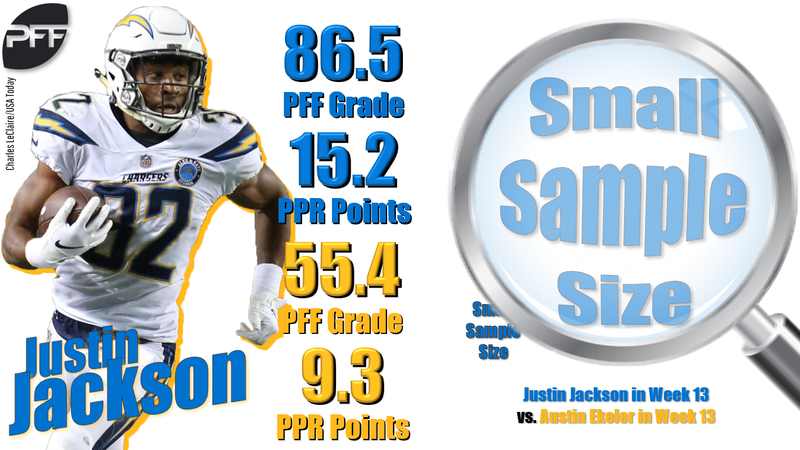 Justin Jackson, LAC (15-30%) — The rookie impressed yet again and was a big part of the Chargers’ comeback win on Sunday night. He’s worth an add, especially if Melvin Gordon misses more time. Rashaad Penny, SEA (15-30%) — Penny continues to be behind Chris Carson on the depth chart, but he flashed major upside in Week 13. Damien Williams, KC (15-30%) — Spencer Ware is already owned in nearly 90% of leagues, but Williams should also be scooped up as a premium handcuff. Jalen Richard, OAK (10-20%) — There’s still a somewhat crowded house in the Oakland backfield, but Richard has consistently shown explosive ability this season. Rex Burkhead, NE (10-20%) — Burkhead is clearly the third man in the Patriots’ backfield pecking order, but he’s worth stashing as a premium handcuff. LeGarrette Blount, DET (5-10%) — Blount comes with limited upside, but he’s seen heavily volume with Kerryon Johnson sidelined over the last two games. Kenneth Dixon, BAL (5-10%) — With Alex Collins now on injured reserve, Dixon is serving as the change of pace back and is the next man up if Gus Edwards gets hurt. Giovani Bernard, CIN (5-10%) — While there isn’t a ton to like about the Bengals offense right now, Bernard did see a lot of work in the passing game last week. Ty Montgomery, BAL (5-10%) — Montgomery isn’t likely to get many touches in the run game, but he’ll factor in on passing downs in December for Baltimore. Zay Jones, BUF (10-20%) — Jones has flown under the radar for much of the season, but he finally surfaced as a fantasy option last week with two scores against the Dolphins. Curtis Samuel, CAR (10-20%) — Samuel’s role has continued to expand, and he actually led the Panthers in targets last week. Michael Gallup, DAL (7-15%) — Gallup had a strong performance last week against the Saints, but don’t overvalue his numbers. He was able to take advantage of a plus matchup against Eli Apple. DeVante Parker, MIA (7-15%) — There isn’t a ton of juice to Parker for fantasy purposes, but he did find the end zone last week. Ian Thomas, CAR (5-10%) — Greg Olsen landing on injured reserve opens the door back up for Thomas to have a role in the Panthers offense. C.J. Uzomah, CIN (5-10%) — Uzomah doesn’t have much upside, but he continues to see plenty of volume for the Bengals. Chris Herndon, NYJ (5-10%) — Despite lackluster fantasy numbers, Herndon saw seven targets in the Jets Week 13 loss. Derek Carr, OAK (1%) — Carr bounced back last week with three passing scores against the Chiefs. Ryan Tannehill, MIA (1%) — While his yardage total didn’t impress, Tannehill did toss three touchdowns against a good Bills defense in Week 13. John Kelly, LAR (1-3%) — With Malcolm Brown banged up, Kelly now sneaks in as the handcuff to Todd Gurley. Chase Edmonds, ARZ (1-3%) — Don’t expect Edmonds to score twice again, but he’s in play as a David Johnson handcuff. Charcandrick West, KC (1-3%) — He’s behind Damien Williams in terms of fantasy preference, but West is worth a look in deep leagues. Stevan Ridley, PIT (1%) — Ridley is a sneaky deep league add with James Conner banged up. Antonio Callaway, CLV (3-5%) — Callaway’s big play upside again came to the surface last week. 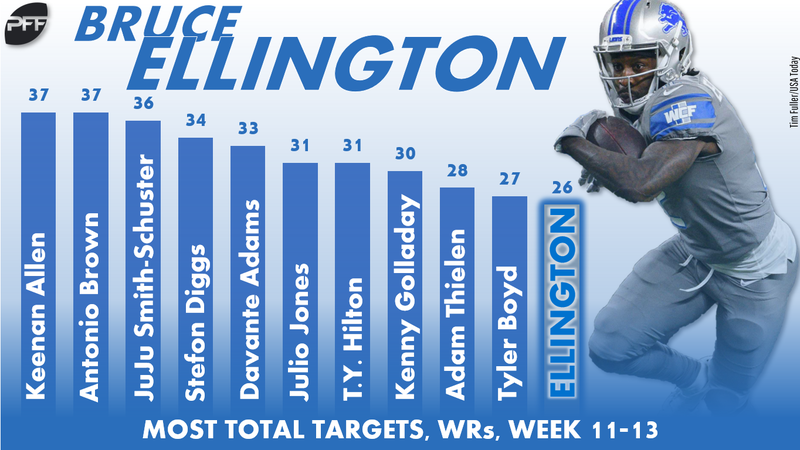 Bruce Ellington, DET (3-5%) — With almost no one left in the Lions wide receiver corps, Ellington has emerged as one of Matthew Stafford‘s top targets. Chris Conley, KC (3-5%) — Conley will continue to benefit as long as Sammy Watkins is banged up. Rhett Ellison, NYG (1-3%) — With Evan Engram banged up, Ellison is in play in deeper leagues. Buffalo Bills (1%) — The Bills are a prime spot to be this week’s top fantasy unit with an extremely favorable matchup against a Jets that has thrown at least one interception in 10-of-12 games this season. Buffalo notched double-digit fantasy points in their previous meeting against the Jets back in Week 10. Tennessee Titans (1%) — Jacksonville’s offensive struggles have resulted in 12 sacks and four giveaways over their last three games. That means good things for the Titans this week. Arizona Cardinals (1%) — Detroit has spiraled on offense through the middle of the season and have allowed double-digit fantasy points to five of their last six opponents. The Cardinals haven’t been a strong fantasy option for much the season, but they’re a high-upside streamer play this week.